Welcome to the incredible and rich world of James Bond 007. James Bond, a fictional character created by author Ian Fleming, has, over the last 65 years, become one of literature and film’s most recognised characters. And this is MI6-HQ.com: the most comprehensive and active website dedicated to James Bond 007. A spy, working for MI6 (the fictional version of the British Secret Service), Bond has risen to the ranks of 00-agent, meaning his is authorised to assassinate in the course of his duties and investigations. The 00-section, a brainchild of the head of MI6, known only as ‘M’, recruits the best field operatives in the service. Each carries a 00-number; James Bond carries the number ‘007’, and whilst other 00-agents are referenced in the course of the film and literary adventures, they are rarely an intrinsic part of the mission. Little is known about his life ouside of his total commitment to his work. He was famously married, once, to Tracy Bond, who died suddenly after the wedding. He lives alone and employs a Scottish housekeeper, May, to look after the home. He (over)indulges in spirits, and gambling and enjoys driving fast cars. 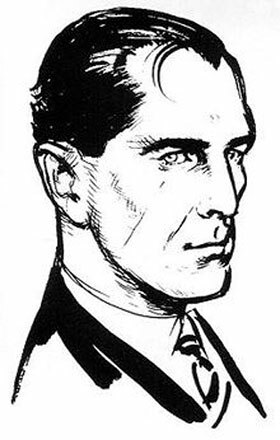 Bond was the orphaned son of Scotsman, Andrew Bond, and Monique Delacroix who both died in a climbing accident when James was 11. He briefly attended Eton, and was later sent to Fettes College, in Scotland. He spent his formative years in Kitzbühel, where a man named Hannes Oberhauser taught Bond to ski and became almost like a father figure. He joined the Navy as part of the Second World War and was recruited to the clandestine departments from there. James Bond, as Ian Fleming wrote him, is typically tall, dark haired, and ruggedly handsome. He is described as having a cruel mouth and cold eyes, and his right cheek is blemished with a thin vertical scar. He is occasionally likened to Hoagy Carmichael; but other than that, his appearance is rarely of note in Fleming’s work. Over the film series his looks have not been strictly adhered to either. He has been played by Brits, Irishmen, Scotsmen and Welshmen and even an Australian. Daniel Craig is the current film incarnation, the sixth in 50 years and, although some fuss was made over Craig’s blonde hair when he was cast, he’s grown into the role and is now generally accepted as the 007 of the era after the success of 2006's 'Casino Royale'. 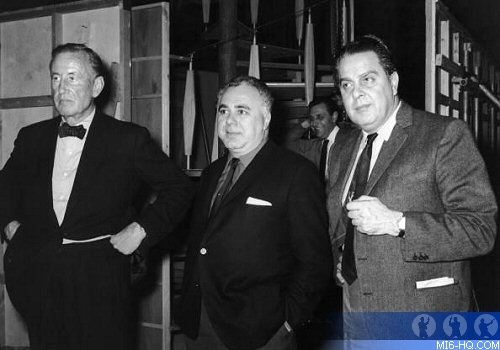 ABOVE: Ian Fleming with film producers Harry Saltzman and Albert R. Cubby Broccoli. Ian Fleming himself, who wrote 14 published volumes (12 novels and two volumes of short stories) between 1953 and 1966. Fleming passed away in 1964 before the publication of his final novel. Ian Fleming Publications (formally known as Glidrose Production), was purchased by Ian Fleming from John Gliddon and Norman Rose. It renamed in the 1990s. Under the watchful eye of Peter Janson-Smith, Glidrose managed international rights and translations until Fleming’s death. The company is now managed by Fleming family members and produces a series of official continuation novels by authors like Kingsley Amis, Raymond Benson, and Anthony Horowitz. Some, like Horowitz have attempted to emulate Fleming’s writing style and set their stories contemporary to his, but the majority have told original stories of James Bond in their own voice and present day. EON Productions and its sister company, Danjaq, were founded by Albert R. ‘Cubby’ Broccoli and Harry Saltzman and is today still run by the Broccoli family. EON purchased the film rights from Ian Fleming and produced 24 official James Bond films between 1962 and 2015. There have been several attempts to make Bond films by companies other than EON but these are considered unofficial or noncanonical by many who follow the franchise. The stories are often considered formulaic, with the girl, the villain, his henchmen all playing their parts. In the film universe we often meet Bond in medias res, romancing a woman or fighting his way out of trouble, or in the case of Fleming’s works, something more pedestrian – enjoying a meal, a card game, driving his favourite Bentley, etc. Bond is summoned to ‘M’, where he is briefed on his mission. On such occasions, Bond often demonstrates himself to be unexpectedly knowledgeable about a subject (diamonds, gold, brandy to name just a few). After having a puzzle or problem explained to him that seems to threaten national economies or securities, Bond is tasked with infiltrating the world of and disarming (often through charm, not weapons) a mysterious businessman, a lovely cypher clerk, a diamond smuggler, an oil heiress, etc. In the cinematic world, Bond is then usually dispatched to ‘Q-branch’, the Quartermaster. The man affectionately known as ‘Q’ heads the branch and Bond is given one or more gadgets or vehicles that could come in useful on the mission. Bond then travels to some far flung corner of the globe. Although he might travel under an assumed name, announcing himself as from ‘Universal Exports’ – a cover that the service maintains for all its agents – the pretence often last no longer than a first meeting and Bond suddenly becomes endangered. A couple of attempts on his life will require 007 to draw on a satisfying combination of wits and Q-branch gadgets to escape the clutches of a henchman. Caught up in the mix is one or more women who are usually connected to the villain in some way: kept women, puppets in his plan, scorned lovers, investigative journalists, CIA agents, or victims of the villain’s past crimes. Bond talks them around to his side and wins an ally on the ground. The final act of the story sees Bond and his accumulated allies mount one last attack on the villains main stronghold, which is often an impressive combination of architecture and defence. Some more memorable ‘lairs’ include volcanoes, super tankers, underground bunkers, trains, eco-hotels, or mountain-top clinics. Aficionados of the franchise will no doubt quibble with the generalisations made above, but the summary serves to introduce new readers to the world of Bond. The films themselves hold a cult place in popular imagination and their timely plots, fantastic stunt sequences, charming allies and creepy villains all contribute to a picture of Bond in the popular imagination, often distilled beyond the nuances of each adventure. With over 20 films, and almost 40 books, not to mention comics, videogames and radio plays, there’s a great deal of characters, locations, food, drink, cars, and gadgets to learn about. And that’s where MI6-HQ comes in. MI6-HQ.com was founded in 1998 just as Pierce Brosnan’s second 007 adventure, 'Tomorrow Never Dies' was wrapping up in cinemas. Yahoo, AOL, MSN, and Geocities were the most popular homepages for web surfers. Elsewhere, Bill Clinton was in his second term as US President and Tony Blair was just getting his feet under the desk of No. 10 in the UK. Very little information about the series was online at the time and the likes of Wikipedia was still years away. For a few years, this was the only real reference material about the Bond films online. We built an online community in the earliest days of the internet and continue to serve that community with regularly published content by a small range of Bond experts. We keep readers up to date on news and rumours around new media (from books to films, videogames to comics - we cover it all). We also have more than 1,000 pages of content, some dating as far back as the 1990s, where we detail key facets of each story in an encyclopaedic fashion. We also run and host a large community bulletin board where you can join hundreds of other fans and experts to discuss the finer points of the franchise. In 2007, MI6 lent our name to a new magazine, MI6 Confidential, which publishes regular in depth analysis and interviews with some of the biggest names from the films and books. After 10 years, MI6 Confidential continues to publish five issues annually with a special 100-page perfect bound issue introduced in 2017. To stay connected we publish regularly to Twitter, Facebook, Instagram; RSS of our news and features feeds. offer occasional email newsletters; and for the biggest announcements you can subscribe to push notifications on your device. MI6-HQ.com is not the secret service, and not affiliated with intelligence gathering or policework in any nation, the UK or otherwise. Please do not send tips or intelligence reports to MI6-HQ.com. The SIS, the British Secret Service, is publicly available to be contacted at www.sis.gov.uk. We are not agents for nor representatives of actors. We do not manage bookings, we do not arrange signings or events for alumni of the Bond franchise. Most importantly, we do not give out contact information for talent we have interviewed. We are not EON productions or official licence holders. We are a not-for-profit fan website, maintained by men and women passionate about the subject. We cannot read or comment on story ideas, treatments or scripts for the next Bond film and cannot facilitate introductions to the producers of the films. We cannot licence, give away or sell you images or intellectual property relating to the James Bond films, books or other media.